Burns, Tara Lee – It's a process. As I’ve mentioned in previous posts, a Sandbox is something Norah uses in her Research Studio class that allows room for change and brainstorming of a group. In the following photos by Dan Shellenbarger (thank you!!) he documented some experiments in my sandbox in February. This project, titled “Tilt World” is an exploration of how an embodied mover informs physical painting in VR using Google’s Tilt Brush while an audience creates an outside environment using found objects. On Monday I showed where I was in my project Tilt World which is investigating a body in a virtual world (Google’s Tilt Brush) and objects and bodies in the physical world. This iteration of the work included three performers. At the beginning of the work, I wore a red face mask and was painting a red house in the virtual environment with Tilt Brush’s wand in front of a wall of cardboard boxes. Later, a dancer in a VR headset was traced by myself. I removed the face mask while she built her own virtual environment to move inside of and then I took the wand again to add to the environment that only she could see. Only the person in the headset can see the painted world. 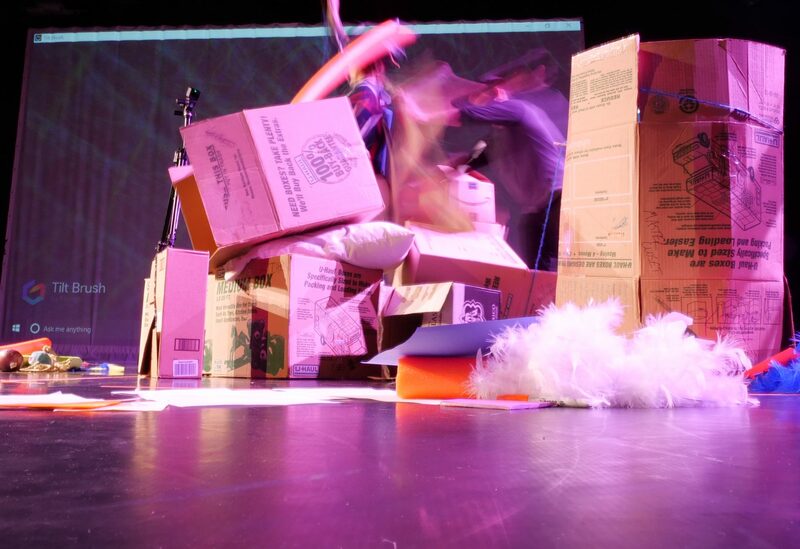 All the while, a third performer was tasked with building and deconstructing environments with cardboard boxes, pool noodles, boas and small toys. This iteration stemmed from my “Sandbox session” in my research class (a Sandbox could be seen as a rehearsal or improvisational physicalization of some ideas). I received three really interesting moments of feedback from this iteration. 1. The audience participation that I have talked about for a while was non-existent in this version. This is so weird because I didn’t realize I deleted this but I feel exactly as Oliver Herring said in his book TASK. So, I have another idea for the second iteration to incorporate the audience from the beginning in perhaps a TASK-like way. 2. During my Sandbox there was a role of care that was included that wasn’t in this role. This is true, but perhaps the builder also needs to be tasked with moving around the person in virtual reality so there is something to protect them from? 3. I needed to be clear what I wanted people to get out of this whole thing. I don’t know the answer to this yet. I think I replied with I wanted each person to feel like they built a world but are watching other worlds built in an alternate reality? I’m not sure that is true but I think this comment links to the idea of roles or tasks. And if so, the audience needs to have one. With my perceptions split wide open (with the floodgates of information that is downloading into my brain) including Queer Theory, Gender Theory, Philosophers Husserl, Butler, Foucault, Kristeva, all bodies and their labels, “The Explicit Body,” Daphne Brooks’ “Bodies in Dissent,” Drew Leder’s “The Absent Body,” readings on the complicated reality of empathy, perception and archive (and that’s just a few, mostly from my Performing Bodies Theory course lead by Dr. Nadine George-Graves), I am wondering where my ideas begin and if I even have any. Everything has been done. Things I don’t want to do, things I wish I thought of and things that I don’t even understand. It’s been done. I’ve heard this before, but now with my brain so full, it feels overflowingly evident. This past week I taught my first full improvisation class and was evaluated by the chair of the dance department. I spoke and some of my thoughts landed in my discussion/theory course and I lead my “sandbox” which is part of my Interdisciplinary Research Studio class. Teaching, leading and talking out of my mouth (as opposed to my body)…higher stakes, yes…and done. I say higher stakes, but I’m not in the real world with these stakes. I’m in a safe little bubble where there are quite a few people that care about movement, embodiment, and dance in the way I do. It is also quite obvious they care about teaching and are very knowledgable in this field. However, I do question the nervousness I feel when presenting in this environment. I have presented during two open works-in-progress showings this year and both have been in the middle of experiments with unknown destinations and/or purpose. I’m going to try to hold strong to the idea that right now is about experiments and possibly failed ones. It’s about my education, my self-exploration and not about what others think of me. Self-doubt is my ally. In class the other day we had to teach something off the cuff with two of these cards. We selected them face down and didn’t know what we were selecting. I like the idea of switching things up with these cards. I have completed my first week back. The beginning of my second semester of the three year MFA at Ohio State University. It took me all week to wrap my brain around the new schedule, the rigor, the brain clenching and ear bleeding thought and the work, but I’m back now. I’ve confronted my ego and my ideas of empathy and self this week and those ladies are tricky. This quote from Parker Palmer has stuck with me all week since reading it Monday and has seeped into other readings about community, pedagogy, Foucault’s ideas of panopticism and discipline, Hartman’s “Scenes of Subjection” and Fusco’s “Bodies that Were Not Ours,” Washington’s “Medical Apartheid” and Butlers super dense “Bodies that Matter.” I’m not sure I’m quite ready for that last one, but we will get there. Authority is granted to people who are perceived as authoring their own words, their own actions, their own lives, rather than playing a scripted role at great remove from their own hearts. When teachers depend on the coercive powers of law or technique they have no authority at all. My youngest daughter’s drawing (3 years old), but how I felt most of the semester. This semester has resulted in a real community of support. My grad-cohort is awesome and most if not all the preliminary tools I need to make, write, create, put forth work and fail have been introduced to me in our “Foundations in Dance Research” course. “Laban Systems: Movements, Methods, and Analytical Frameworks” has been a wonderful addition to the writing kind of making. Not only do I have a new treasure chest of descriptive words specifically crafted for movement, but also a new way to look at movement and a toolbox of sprinkles and ingredients to add to my movement-making process. “Aboutness” can be applied to my whole first semester here. Trying to frame and understand specifically what I am interested in is the “aboutness” of my work and my-artist-self. My body feels strong and smart. I am articulate in my joints and muscles in a way that I haven’t been for a while and it feels amazing. Crystal Perkin’s Afro-Horton technique class was an integral part in this strength and agency as was my Pilates course. I was able to apply Pilates techniques in Crystal’s technique class. The integration of whole body movement in Pilates is something I am still working on but I now have a practice to bring with me for the next two years. Pilates challenged my self-motivation in multiple ways and Crystal’s class was my grounding force throughout the semester. Technique class is my home, I know how to be a dancer and trust the movement and my body, so once I gave into the discipline and physical effort, this class was healing and got me through other more tumultuous moments. I believe the next two and a half years will result in a confident, strong, maker who can own her place in an academic setting. This department has a professionalism built into it that is transparent but also ingrained. Research is what you make it. Figuring out what specifically interests me is the hardest part. There seems to be a fine line between what I’m interested in and what falls flat. In this academic context, it’s about framing your questions and spending time figuring out your project and writing it down before you actually get to figure anything out. This backwards approach is difficult for me but a skill worth developing. It’s similar to grant writing, but with a different flavor I can’t quite place. In the moments to come, I’m interested in exploring some new practices of making, perhaps more improvisatory or contact-based processes, perhaps some making with friends/current grads, perhaps some non-mandatory uses of technologies. I’m still working on what I’m interested in, who I’m interested in doing it with and how to get it done in this still new environment but I trust the process. At the end of the day, it’s about coloring inside and outside the lines. It’s about appreciating all approaches and angles but also figuring out where you fit into them, how to best apply them to help you grow and how you want to approach your own angles or angle your own approach.